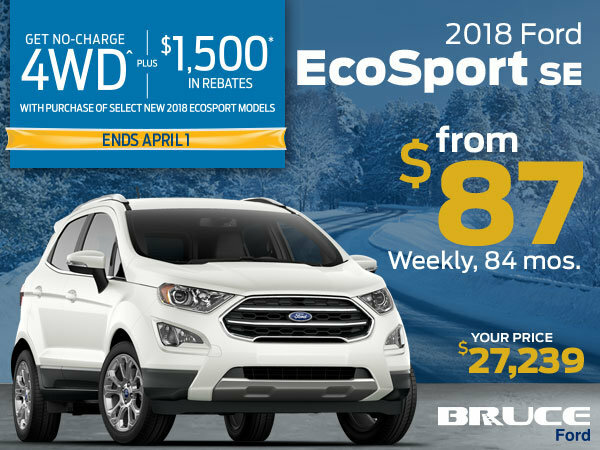 Until April 1st, Get No-Charge 4WD, plus $1,500 in Rebates on Select New 2018 EcoSport Models. Our featured EcoSport is a 2018 SE. This SUV is loaded with technology to take your driving experience to a new level! Finance from $87** Weekly over 84 Months. Save fuel without sacrificing space in your new Ford EcoSport - get started by booking your Test Drive today! **On approved credit. Taxes/Fees, Dealer Installed Accessories not included in payment.